CobraZol is a non-addictive anti-inflammatory medicine primarily aimed at treating moderate to severe chronic pain. 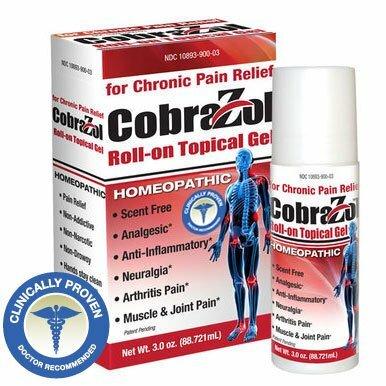 The active pharmaceutical ingredients in CobraZol are the neuroactive peptides of 3 different types of snake venoms as well as well-known natural analgesics such as arnica, boswellia, and MSM along with a patent-pending transdermal delivery system. CobraZol is specifically formulated to relieve back pain, neck pain, joint pain, arthritis pain. In a double-blind placebo crossover trial clinical study it was shown that CobraZol that relieved muscle and joint pain in 87% of the patients tested. CobraZol contains actual venom from three snakes: Indian Cobra, the Mojave Rattlesnake and the South American Bushmaster. All three of these neurotoxic snake venoms have been used in homeopathic practices since the late 1800's and earlier in both Chinese and Indian Ayurveda medicine. Each venom is believed to work by targeting receptors on nerve cells. These receptors are found in nerves outside the central nervous system (brain and spinal cord) and they are also found on cells of the immune system. As a result, the pain and inflammation pathways are temporarily shut off. In some clinical studies, Indian Cobra Venom has shown to provide prolonged chronic muscle pain, and joint pain relief. CobraZol also contains, Arnica, Boswellia, Capsacin, MSM, and Curcumin. Recommended for Use On Its Own or As A Complimentary Application along with Braces, Splints, Gloves, Ultrasound Treatment, Physical Therapy, Massage, etc. CobraZol treats conditions that cause chronic pain, such as lower back pain, arthritis, joint pain, muscle aches, neck pain, and more. Patented Formula Developed by Homeopathic Practioners and Chemists at Nature's Innovation. ClINICALLY PROVEN!! Guaranteed to Work or Your Money Back! If you have any questions about this product by CobraZol, contact us by completing and submitting the form below. If you are looking for a specif part number, please include it with your message.